Forget home automation, the next big trend in consumer living will be “smart homes,” defined as a connected products that work in conjunction with an app or web portal. 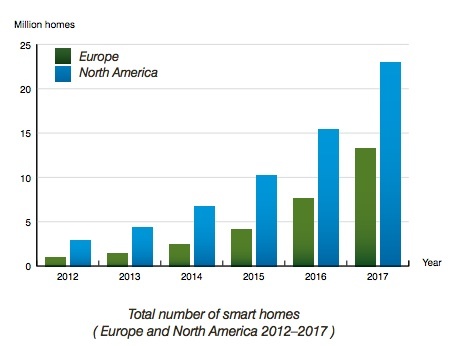 That’s how analyst firm Berg Insights has chosen to define the market and based on that definition, it says that America had 3.5 million smart homes at the end of 2012 and both the U.S. and Europe combined are on track to have 36 million by 2017 with sales of $9.4 billion a year. Most of the existing “smart homes” aren’t actually homes that are smart, but are rather point products such as a Nest thermostat or other single-feature devices like locks. Berg believes that Europe is about three years behind the U.S. I tend to believe that these estimates are mere dart-throwing but I am interested in how Berg divvies up the market. It is tracking six categories: energy management and climate control systems; security and access control systems; lighting, window and appliance control systems; home appliances; audio-visual and entertainment systems; and healthcare and assisted living systems. If pressed, I think that the energy and climate control systems should and will meld with the lighting and appliance control because the two are so intertwined. Further out, I am curious how the car will play into these systems because it will need links to at least the energy management systems if it is electric, and the entertainment systems no matter what. And while I don’t like the idea, I agree that health and assisted living will remain a separate category from all of these despite the best efforts of Jawbone and others to link your fitness trackers to you home. Any truly medically necessary device is going to come from the doctor and not the consumer market in the near term, which means that for aging Americans we might see smart homes rise simply because their doctors and concerned children force it onto them. The real question there is who will be doing the prescribing. If it is children wanting to keep an eye on aging parents, then consumer solutions will dominate, but if the medical establishment becomes comfortable with remote monitoring then it could be an opening for bigger medical and tech partnerships such as the ones Philips and Salesforce announced this week.